Growth in home renovations and remodels has been steady since 2012, and the Residential Remodeling Index predicts continued growth into the future. Many renovations are trending from coast to coast, such as installations to increase energy efficiency, sustainability and security. There are some, however, which are more popular in specific regions. Indoor/outdoor living areas are trending across the nation, but the West Coast carries the torch. The region’s climate practically begs you to incorporate the outdoors into your everyday activities. 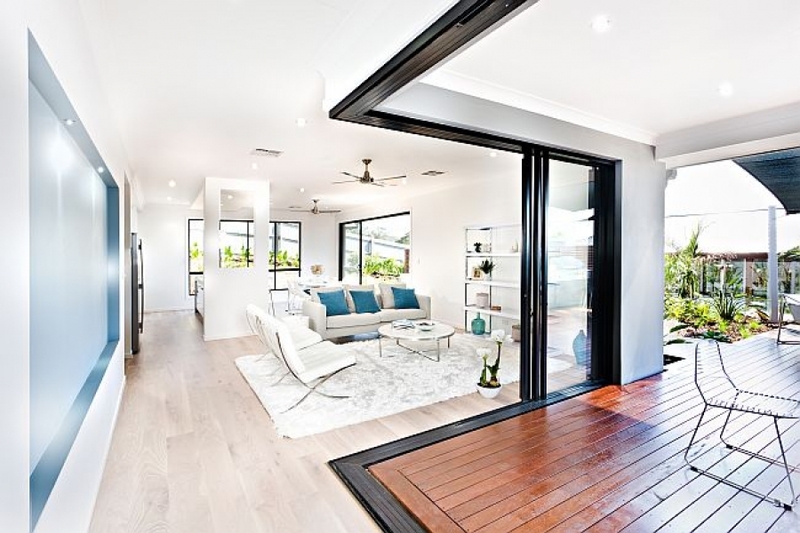 An Open Wall – Remove the barrier between your yard and home by replacing an entire wall with glass doors, which can be opened and shut as-needed. You will find glass walls like this off of kitchens, family rooms and even bedrooms! A Table Outside – Move your kitchen and dining area outside, right outside the home and covered for use in any weather. With an outdoor kitchen, you can enjoy nature and a fresh breeze while you cook, rather than being confined. In the mountain region, more and more people are turning their basements into livable spaces. This is a fantastic way to add useful space, as well as value. Family Den – Create a downstairs family area, complete with a bathroom, couches and a television for video gaming and movie nights. Home Office – Shut yourself away from dishes in the sink, laundry on the floor and attention-hoarding animals. Guest Living – Give your in-laws a space of their own when they visit so that you can all have your privacy, without tripping over air mattresses. In the south, homeowners are making modifications which will help them to age-in-place. When people think of accessibility renovations, they don’t often envision anything glamorous. However, your adaptations don’t have to be boring. The changes you make can enhance the aesthetic of your home if you thoughtfully chooseng materials and design. Easy Navigation – Widen doorways and remove steps between rooms and at entryways, so that access is flat and easily navigated. Easy Access – Install a bathroom right by the entryway and retrofit the kitchen and bathrooms for wheelchair or walker access. In the Northeast, deck additions have one of the greatest returns on investment, and the residents have taken note. Having a deck can make your home more competitive in the market. If you’re renovating for yourself, it’s a great way to create an outdoor area for family gatherings and relaxation. Entertain – Build your deck off the kitchen and outfit it with a table and chairs, to make hosting more seamless. Unwind – Put your deck in a shaded corner and furnish it with comfy, weatherproof chairs for lounging. Consider installing an outdoor fireplace and a television. Midwesterners are remodeling their bathrooms, even though the return on investment isn’t as high as with many other projects. Bathroom renovations are often homeowners’ treat to themselves, as they turn their house into their dream home. Mirror, Mirror – Choose a theme that reflects your personality. Trending styles are farmhouse, vintage and minimal. The Works – Install a spa tub or shower jets, and splurge on heated flooring. These are some of the most popular remodels happening across the nation, as people craft their perfect home or prepare it to sell. Making renovations isn’t as simple as picking a project, however. You may be wondering how your neighbors have the resources to pursue such lofty endeavors. HomeAdvisor put out a True Cost Report which outlines several aspects of home improvement in 2017, including financing, which is a great resource on the year’s trends.